I didn’t set an alarm this morning, but I knew I needed to leave before Cartwheel and Robin Hood woke up so that it wouldn’t be difficult to leave. I woke up around 5am and laid there for a bit. It had been another humid night of sticking to the sleeping pad and I didn’t get a full rest. I got motivated and packed up as quietly as I could as no one out of the 40 or so camped there was awake. I was hiking by 6am and two other thrus were just getting up. Mission accomplished. Given that I hiked an extra hour today, I didn’t get the 30mi day I had aimed for. The trail went in and out of varying levels of rockiness and I just couldn’t get a rhythm going all day. 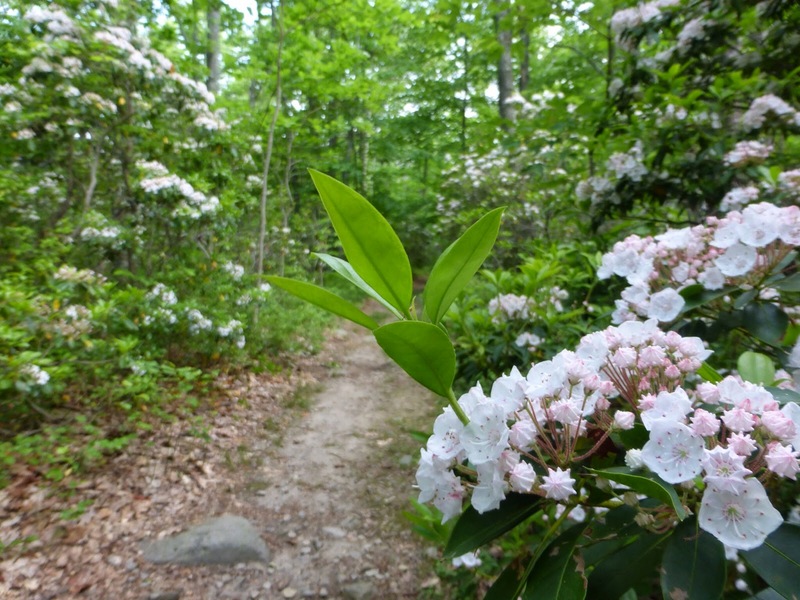 One noticeable thing was that the mountain laurel are in full bloom and they lined the trail and filled the forest around it quite often. 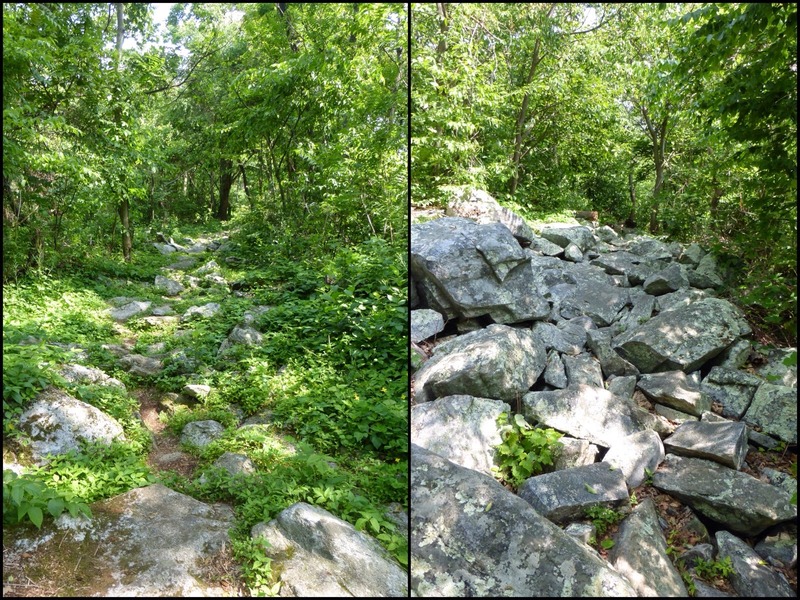 The only other thru hikers I saw a couple of times were Unity and Stick In the Mud who we overlapped with on and off in Shenandoah last week. Everyone got randomly spread out with the Harpers stop because that is where many people have family visit or go to DC. I know a few of the hikers ahead of me and I may get back in the pattern of meeting new people each day if I keep a good pace up this leg. Not too much to say about the scenery today as there were only a few views or sites. Most of the day was forested and fairly rocky. 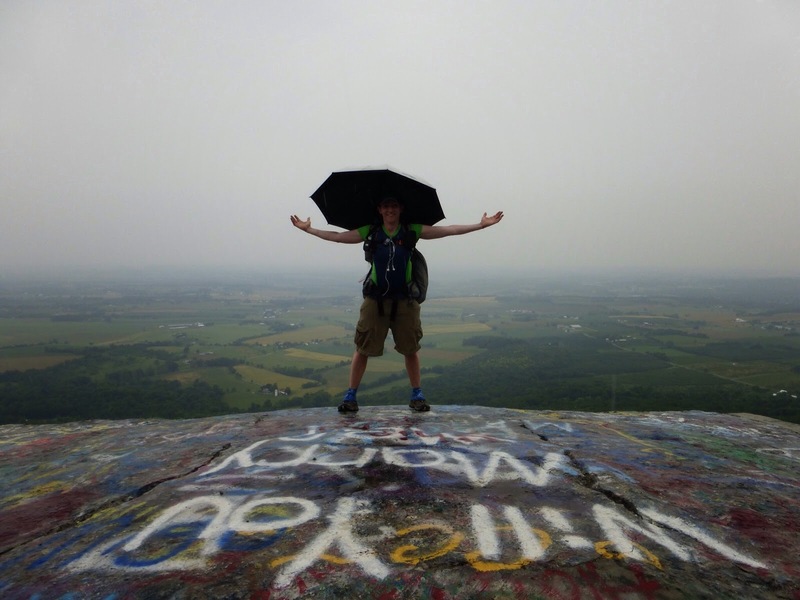 I did go off trail two different times for viewpoints at Annapolis Rocks and High Rock(with lots of graffiti). I’m actually just now noticing I’m standing on a proposal! It started raining at 3:30pm and is expected to go on and off through the night with thunder rumbling throughout the day. It’s pretty much a 50% chance of rain or thunderstorms all week and that’s annoying, but also nice with the overcast skies. The tree cover did a great job of catching much of the rain. It’s fun to hear a steady shower overhead with much fewer drops making it though. Again, I’m loving the umbrella as it’s very warm and humid so I wouldn’t want a raincoat or rain pants. Now lightning is flashing as I write this in the safety of my ZPacks Soloplex. I have to say that I recommend it. I’m camped in leaves tonight and that seems to be the key in the rain for this tent. Padded surfaces absorb the rain better so there isn’t the splashing that I’ve had on the more compact ground of a frequently used camp spot. I forgot to get a picture of camp tonight since it has started raining hard and is now getting dark. I did start a new audiobook today and put The Road on hold for a bit. Robin Hood and All In had been reading the Alchemist the last couple of weeks and finished it this weekend. It was at Robin Hood’s request as another hiker mentioned it as their favorite book. I had it as one of my audiobooks for the hike and decided to listen to it before finishing The Road. It is short and just a few hours to listen to. So far, I’m a fan. It’s a good one for hiking as it’s about a young man on a journey, reasoning life, and his purpose in the world. Hard to summarize as it’s also reminiscent of myths or the biblical stories with a great amount of philosophy and faith involved. The only thing that bothers me in multiple days of wet weather are my feet. They got damp today which I’m glad isn’t worse, but with the humidity, they don’t dry out and they get sore and wrinkled the next day. Over multiple days I feel it in my foot and toe joints. Plus it’s rough on the bottoms of my feet with lots of dead skin that itchesi. Hopefully, I’ll be on the drier side of the 50/50 chance for rain this week. 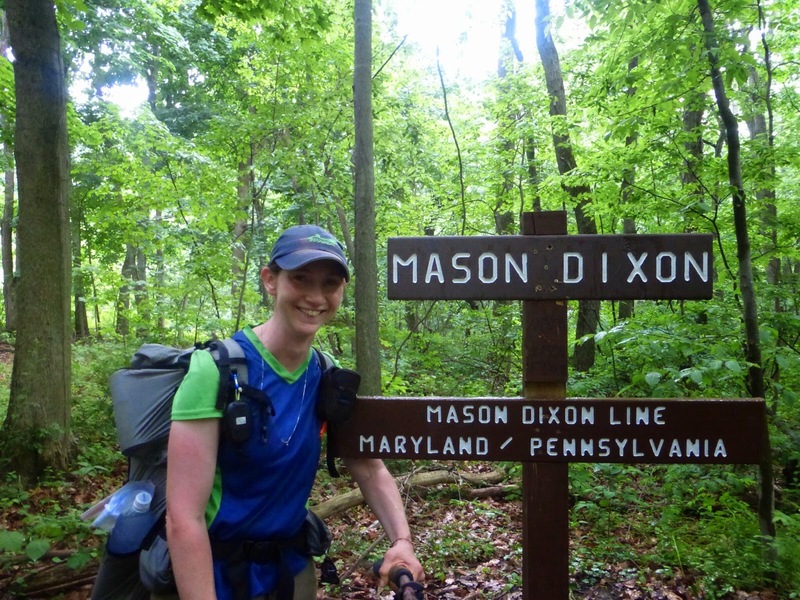 The major milestone at the end of today was crossing the Mason-Dixon Line which is also the border of Maryland and Pennsylvania. I’m officially in “Rocksylvania!” Yes, that was a short time in Maryland which is 41mi long. 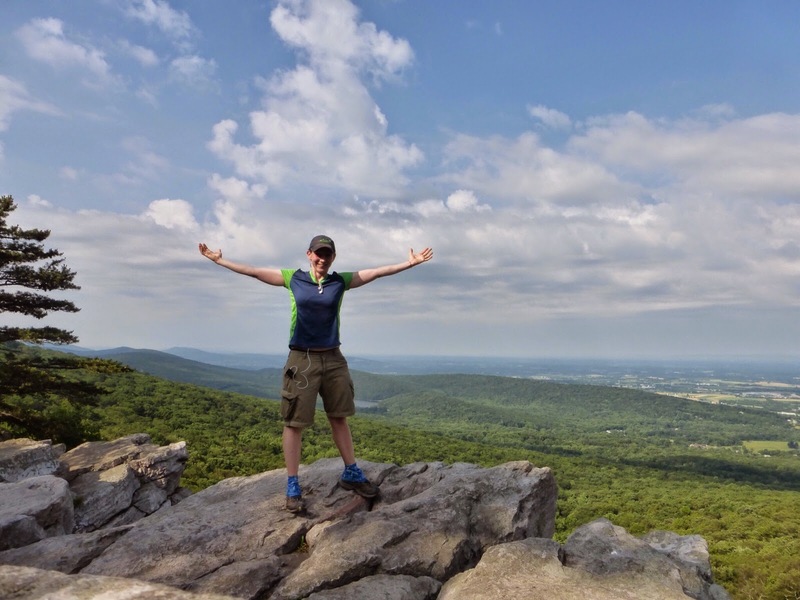 I was surprised at the amount of rocks in northern Maryland though. That was during the rain and it was really slow going for me on the slippery rocks. I’m expecting a lot more of it in the next couple of weeks. I’ve heard it really starts after this leg, so I guess that’s a good thing. It’s now pouring hard with lightning and thunder and I’m thankfully fully protected. Hopefully it will pass by the morning. It may end up being a pee in a Ziploc kind of night!